The number of artist albums sold in the UK in 2003 rose more than 7% to almost 121 million. Does this mean the British music industry is beating piracy? Or is it a brief golden period? Worldwide, the music industry has had to deal with tough times over the last few years. 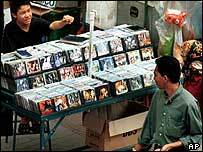 Sales of CDs have fallen consistently since the late 1990s - hit by internet downloads the music industry says are illegal and millions of counterfeit CDs produced by illicit factories. But figures in this week's issue of UK music industry magazine Music Week show artist albums - excluding compilation albums - sold 120,968,891 in 2003 - a rise of 7.6% on the previous year. Some attribute part of the upturn to interest in new acts like The Darkness, The Thrills, Damien Rice and Dizzee Rascal. The figures seem to contradict warnings that piracy is killing the UK music industry. But the answer, say some music figures who spoke to BBC News Online, is not so simple. Piracy remains a huge problems in the UK, says Matt Phillips, a spokesman for the British Phonographic Industry (BPI) trade organisation. He said a common misconception was that '"industrial piracy" - where CDs are mass produced in illicit "factories" working round the clock - was an overseas problem, with pirated CDs being smuggled in from countries such as the Ukraine and China. "A lot of them are produced here in the UK, and they have links to organised crime. We are finding that there are often huge networks of distribution. "Very often there are factories - which are very hard to find - churning out these CDs 24/7. We are working with trading standards to try and stop them. Often these criminals are doing other stuff as well." The decline of the single - which according to the Music Week figures fell another 30% last year - was a victim not only of internet downloads, but of the closing gap between single and album prices. "The average price of a single is now about £3.30," said Genarro Castaldo, an analyst for retail chain HMV. "You can get an album for about £9 or £10 now. That represents a lot better value." Retailers are also much more aggressive in promoting albums, Mr Castaldo said, with most chains offering discounts and sales on various chart albums every month. This is partly a reaction to the new outlets people can buy their music in, and the fact fierce competition has driven price down. Supermarkets such as Tesco and Asda are aggressive in their attempts to sell CDs for the cheapest price possible. Music Week executive editor Martin Talbot said the effect of supermarkets on music sales was a relatively new factor in the UK. "It is only in the last few years that supermarkets in the UK have been selling large amounts of CDs. They are making it more and more difficult for the specialist music chains." Mr Talbot said the supermarkets concentrated on a narrow range of artists. "They sell a lot of artists such as Jamie Cullum, Katie Melua, Hayley Westenra, Dido and Will Young. "They are selling to people who might only buy three or four records a year because they have seen someone on the Parkinson show." Mr Talbot said this could affect music sales in the future. It would mean fewer profits going back to record companies and publishers, and less money to invest in new acts, he said. "This is something the music industry really needs to keep an eye on," he said. "The traditional role of smaller, independent stores over the last 30 years has been to develop the next wave of talent." 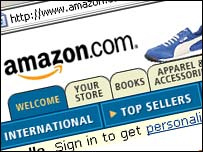 In the past five years online retailers such as Amazon have also emerged as a major force. In particular, Amazon says its UK site has recorded its most successful Christmas yet, they told BBC News Online. But the BPI is currently investigating Amazon - and fellow internet retailers CD-Wow and Play.com - because of accusations they are selling CDs bought from outside the European Union, which contravenes UK law. At HMV, Mr Castaldo said the British public would still patronise high street stores, despite the additional choice offered by new outlets. "The British public has this relationship that is almost like an emotional bond with the artists who make the music. I think this stems from the 1960s pop explosion when everyone seemed to get into music," he said. Both he and Mr Phillips are confident 2004 will be another good year for album sales. "There's a lot of cause to be quietly confident," Mr Castaldo said.